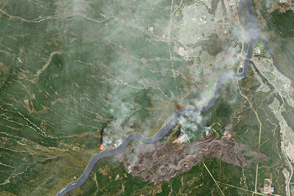 More than two weeks after a forest fire broke out near Fort McMurray in the Canadian province of Alberta, the fire was still raging. 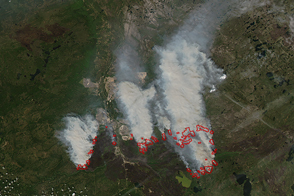 After burning through Fort McMurray, a shift in the winds on May 16 began to push flames back toward oil sands infrastructure north of the settlement. 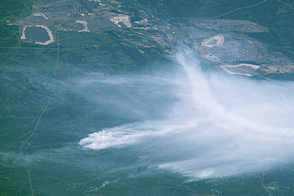 One worker camp north of town was overtaken by the fire in the afternoon on May 17. 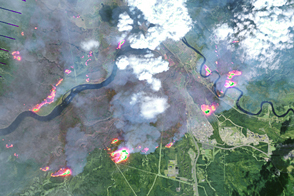 On May 16, 2016, at 19:40 UTC (1:40 p.m. local time), the Visible Infrared Imaging Radiometer Suite (VIIRS) on the Suomi-NPP satellite captured a natural-color image of active fires near Fort McMurray. 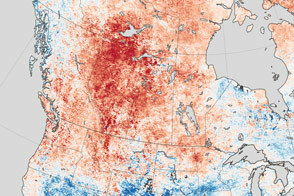 Red outlines indicate hot spots where VIIRS detected warm surface temperatures associated with fires. 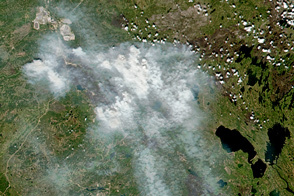 Thick plumes of smoke were blowing to the northeast. 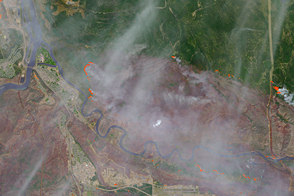 A shift in the winds has put worker camps north of Fort McMurray at risk. 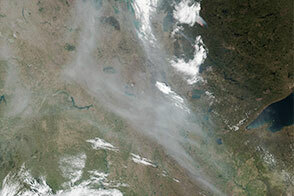 In early May 2016, fires broke out near Fort McMurray in Alberta, Canada. Alberta Agriculture and Forestry (2016, May 17) Wildfire Status. Accessed May 17, 2016. 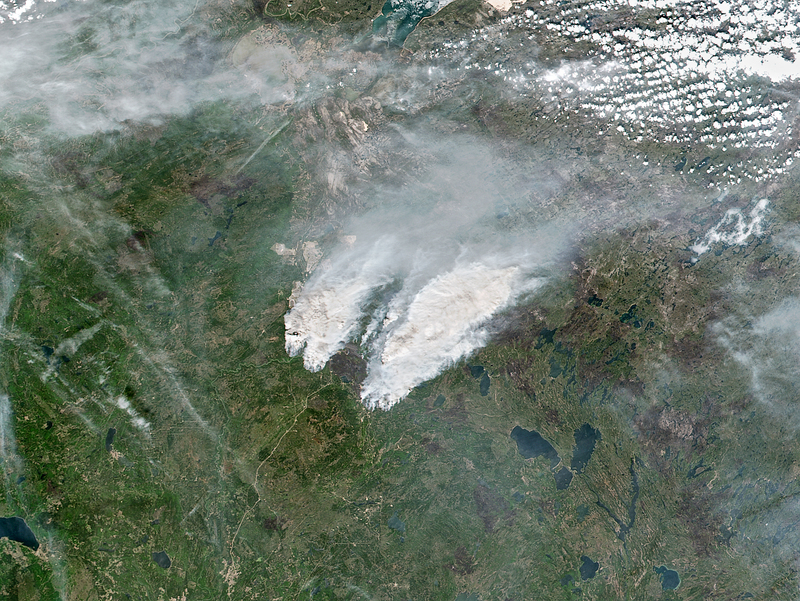 Alberta Government (2016, May 16) Update 16: Fort McMurray Wildfire (May 16 at 1:45 p.m.) Accessed May 17, 2016. Edmonton Journal (2016, May 17) Two home explosions in Fort McMurray, camp lodge destroyed and others threatened as wildfire grows. Accessed May 17, 2016. 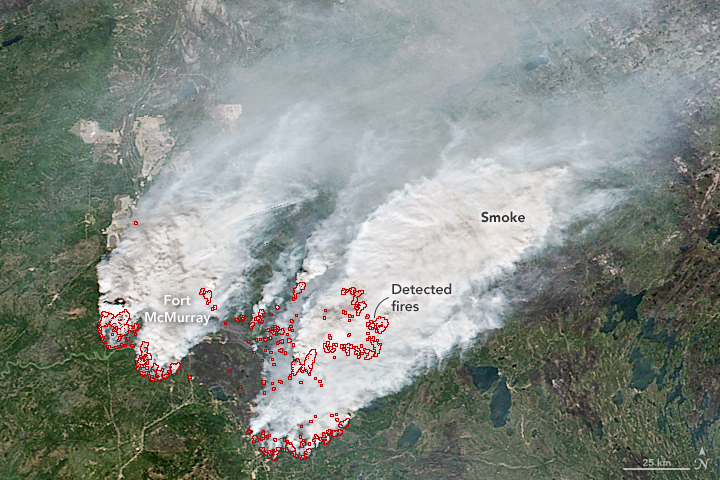 The New York Times (2016, May 16) Wind Pushes Raging Alberta Blaze Back Toward Fort McMurray. Accessed May 17, 2016.